When it comes to teeth whitening Colorado Springs area residents have a lot of questions about their options. Colorado Springs teeth whitening is a multi-million dollar industry, and it is growing rapidly. The choices can be confusing and overwhelming. Suffice it to say that you will get different results from an over-the-counter kit than you will from an in-office teeth whitening. Nowhere is the adage “You get what you pay for” more appropriate than in the multitude of choices for tooth whitening. Whitening toothpaste, does it really work? Be careful with whitening toothpaste. They can make your teeth sensitive, and often the whitening results are disappointing. Consult your dentist about brands and information on which is the best choice. What about the OTC kits? You will get some results with over-the-counter whitening kits, but again be careful. You may get side effects you didn’t bargain for. Again lots of variables. Some dentists give inexpensive whitening kits as premiums to new patients. Many of these kits are similar to the over-the-counter kits from your drug store. Some of them are more effective than others. The best Colorado Springs teeth whitening take-home systems are the ones with custom-fitted trays that you use once a week with a tube of gel. Your dentist takes an impression of your teeth and makes the trays for you. He will also supply you with refills for the trays. 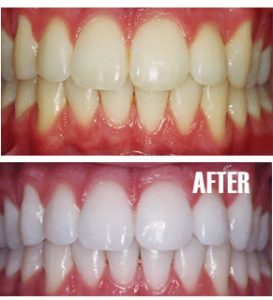 If you are committed to using the trays regularly, the long-term results can be as good, or better, than other teeth whitening. Expect to pay $200 to $300 for the better systems. For a brighter, whiter smile without the wait, choose Opalescence Boost, an in-office, chemically activated teeth whitening treatment that offers visible results in less than an hour. It’s ideal for people who want instant teeth whitening gratification or those who have that special event coming up that requires a bright, white smile.